I photographed Wave Rock twice on an overnight visit to the iconic location as part of a stop over during a road trip further south. I woke up early and only just in time for sunrise. I looked out of my tent and the sky was lighting up. I got up, grabbed my gear, and started running to the Wave. Waking up and immediately running can certainly make you feel a bit odd. I framed up the shot and managed to capture the stunning and very intense sunrise colours. So stoked to have been lucky enough to capture this famous West Australian location under great light on the only morning I had there. This was certainly a great start to the trip. 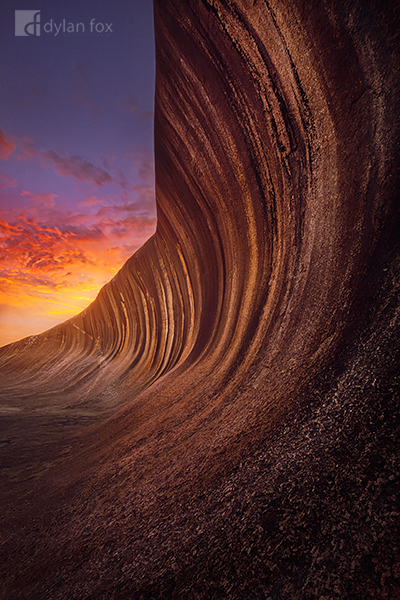 Wave Rock is 15 meters tall and 110 meters long. It was formed by weathering and water erosion and the rock has been dated back 2700 million years. Water running down the rock dissolves minerals which has added to the colour and contrasts in the stone. Secure your limited edition, Wave Rock photographic print, 'Waves Gone By', by selecting your desired print size in the menu to the right.